"Grim has found it difficult to live without a servant (if 'living' is the correct term), and has gotten himself into another domestic muddle. Rather than help him with the chores this time round, you'll be required to remove something unwanted from his bathroom. That 'something' is slightly more dangerous than belly fluff stuck in the plug hole." Note: This event was only available from 26 October 2009 until 9 November 2009. 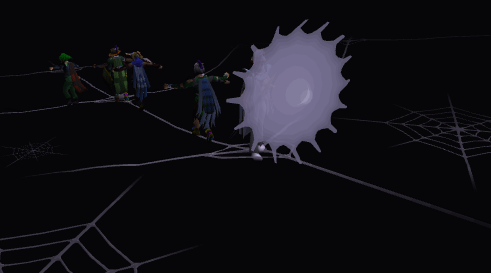 Enter the Dark Portal south of Falador. 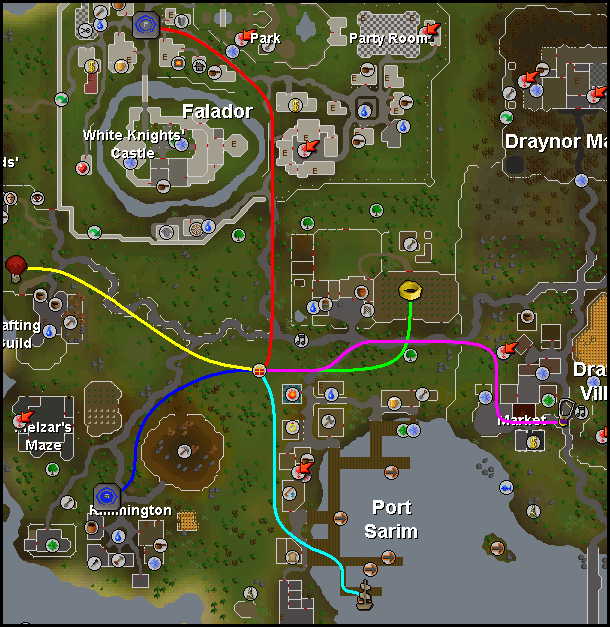 To start this quest, find the dark portal south of Falador and west of Port Sarim, near the Elemental Mages and Malignius Mortifer. As you near it, you'll notice your screen will get considerably darker. When you enter the portal, you'll wind up in a strange house, and unlock the track 'Trick or Treat?' 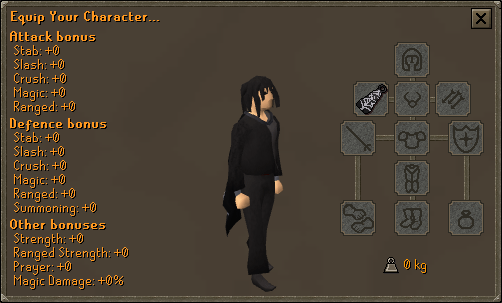 Welcome to Chez Grim Reaper! 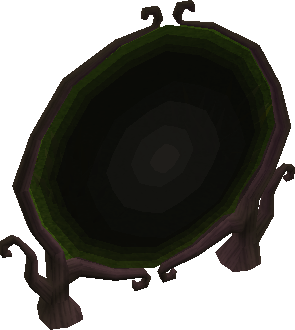 If at any time you wish to leave, simply click the portal again and you'll wind up south of Falador again. 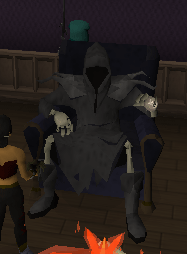 Walk into the living (dead) room and you'll see the Grim Reaper himself. There's a spider in his bathtub! Head to the upper floor by going up the stairs, then head go to the room east of the staircase to go to the bathroom, and you'll see why he's so worried about a spider in his bath. Talk to her, and the spider of few words will tell you she'll only move if the Spider Queen tells her to move. 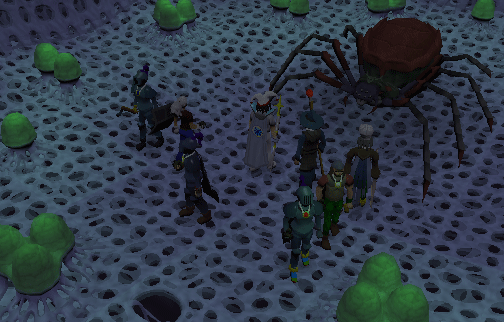 For reasons unknown to us, the Spider Queen has told the spider to sit in the Grim Reaper's bathtub. Go back downstairs and report your findings to Grim. 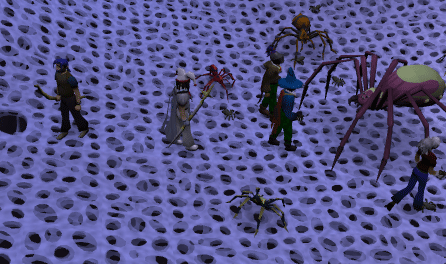 Grim will tell you to negotiate with the Spider Queen, and will open up a blue portal next to you. Go through it to enter the Spider Queen's plane, which is a rather Spiderman-esque establishment. You'll unlock the track 'Itsy Bitsy...' at this point. 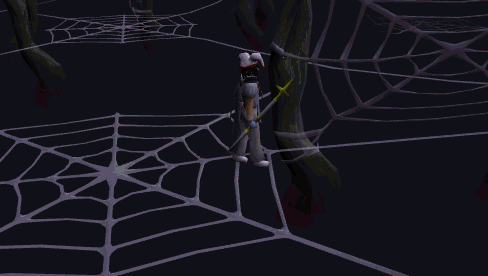 Walk along the spider's webs by clicking from one web to another. 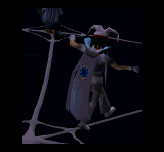 Most strands of web will be unstable. If you walk on one of the unstable ones, you'll fall and be brought back to the start. 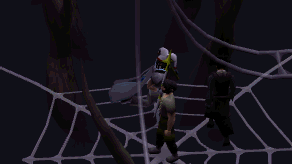 If you have completed Underground Pass and/or Lunar Diplomacy, this kind of puzzle may be familiar to you. As you may well know, it helps immensely if you keep track of which webs are walkable on and vice versa on a program like Paint. As per usual, the puzzle is different for everyone. 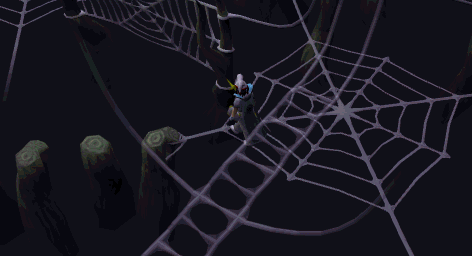 The aim of the game is to get to the center of the web, and climb up the web ladder, which you can see on your mini map. When you reach the top, you'll find another floor with more puzzles. This floor resembles a playground with monkey bars, swings, nets, stepping stones and so on. You can NOT fail anything on this floor. Make your way towards the north part of the obstacle course, and climb up the ladder. You'll arrive in a room that looks like it's crafted from styrofoam and unlock the track 'Poison Dreams'. Talk to the Herald, and tell him Grim sent you, then climb up the ladder. 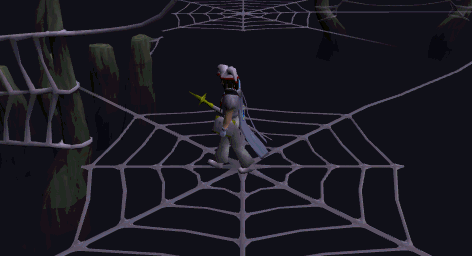 You'll arrive in the Spider Queen's chambers, with the Queen herself. The Queen will tell you that she put the spider in Grim's bath because he insulted her by cleaning the cobwebs from his house. 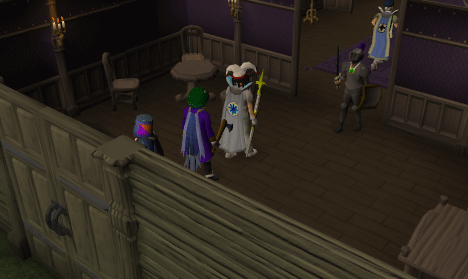 She explains that Guthix ordered Grim to wear a cloak, wield a scythe, have a lack of any skin whatsoever, and have spider webs in his house. The Queen will tell you to speak to the Herald, so go back downstairs and talk to him. He will give you a companion for the journey back to Grim's house, the tiny Eek the spider. 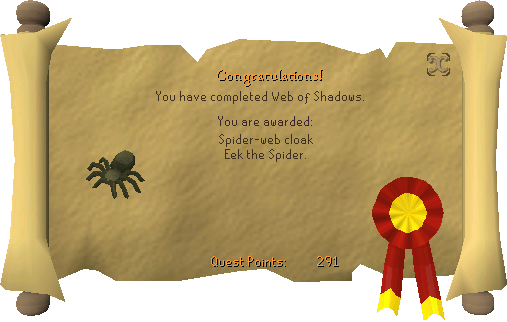 Talk to Grim, and he'll ask you to use Eek to cover 64 pieces of furniture in his house with webs. 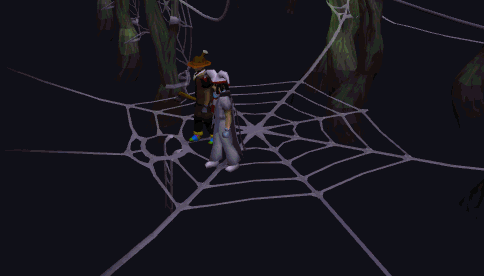 In each room you walk into, Eek will tell you how many things he needs to coat in webs. To find out if something is web-able, right click on a piece of furniture. 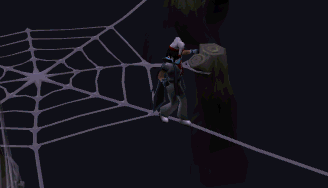 If you have the option to 'Web' it, you must web it. Note: The room south of Grim's room counts as the same room. Rooms are separated by doors. This room is slightly different. 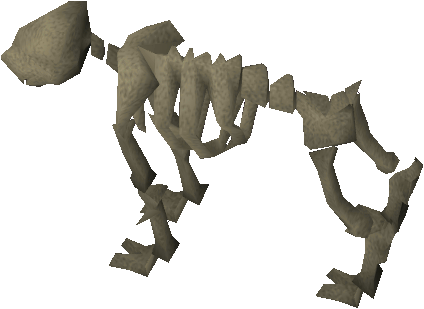 Eek will be too scared to web anything up because of Grim's skeletal dog, Muncher. You have four options to calm him down: stroke him, entertain him, blow a raspberry at him, or let him sniff Eek. Your character will refuse to stroke him, blowing a raspberry at him will instantly kill you (you won't lose anything and will appear at the porch of Grim's house), and letting him sniff Eek won't really do anything. The table with the plant on. Climb up the stairs and move onto the second floor. Note: Again, all of the corridor is one room. Rooms are separated by doors. Note: The two bookcases joined together count as one bookcase. Note: Again, the two bookcases joined together count as one bookcase. 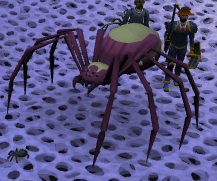 The Spider Cloak the Queen gives you gives no bonuses, weighs nothing and has no special feature like previous holiday rewards. It's just there to look nice. 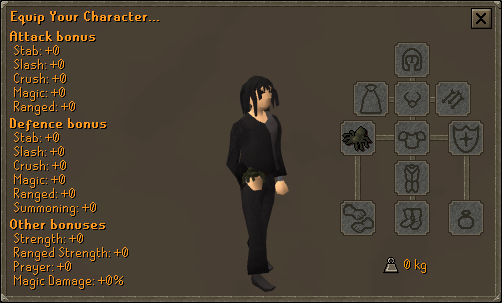 Hold/Remove - Equips or un-equips Eek. Talk to - Brings up numerous amusing conversations with Eek. Play-with - Eek spins a web and dangles between your hands, the builds another web and hangs from that. 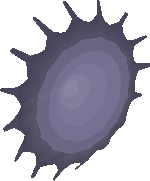 Eek can be stored in your menagerie.